Jaundice is a yellow color of the skin, mucus membranes, or eyes. The yellow coloring comes from bilirubin, a byproduct of old red blood cells. Jaundice can be a symptom of several health problems. A small number of red blood cells in your body die each day, and are replaced by new ones. The liver removes the old blood cells. This creates bilirubin. 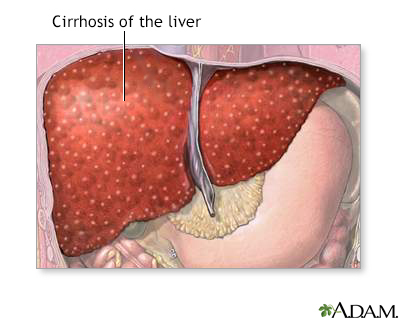 The liver helps break down bilirubin so that it can be removed by the body through the stool. Too many red blood cells are dying or breaking down and going to the liver. The liver is overloaded or damaged. The bilirubin from the liver is unable to properly move into the digestive tract. Blood disorders, gallstones, birth defects and a number of other medical conditions can lead to jaundice. 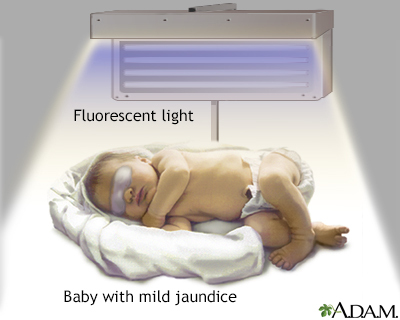 For more information on the causes of jaundice see: jaundice causes. Note: If your skin is yellow and the whites of your eyes are not yellow, you may not have jaundice. Your skin can turn a yellow-to-orange color if you eat a lot of beta carotene, the orange pigment in carrots. Cancers may produce no symptoms, or there may be fatigue, weight loss, or other symptoms. Hepatitis may produce nausea, vomiting, fatigue, or other symptoms. Contact your provider if you develop jaundice. Fargo MV, Grogan SP, Saquil A. Evaluation of jaundice in adults. Am Fam Physician. 2017;95(3):164-168. PMID: 28145671 www.ncbi.nlm.nih.gov/pubmed/28145671. Wheatley MA, Heilpern KL. Jaundice. In: Marx JA, Hockberger RS, Walls RM, et al, eds. Rosen's Emergency Medicine: Concepts and Clinical Practice. 8th ed. Philadelphia, PA: Elsevier Saunders; 2014:chap 28. Jaundice is a condition produced when excess amounts of bilirubin circulating in the blood stream dissolve in the subcutaneous fat (the layer of fat just beneath the skin), causing a yellowish appearance of the skin and the whites of the eyes. 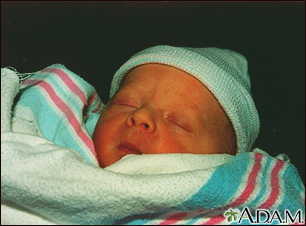 With the exception of normal newborn jaundice in the first week of life, all other jaundice indicates overload or damage to the liver, or inability to move bilirubin from the liver through the biliary tract to the gut. Using bili lights is a therapeutic procedure performed on newborn or premature infants to reduce elevated levels of bilirubin. 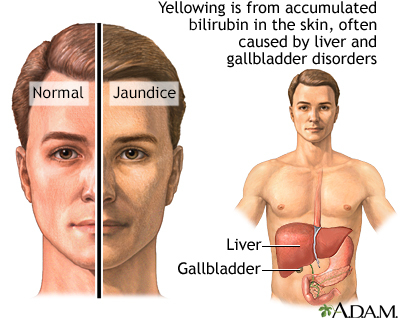 If blood levels of bilirubin become too high, the bilirubin begins to dissolve in the body tissues, producing the characteristic yellow eyes and skin of jaundice. Bilirubin also has an affinity for brain tissue, where it can accumulate and cause permanent brain damage.